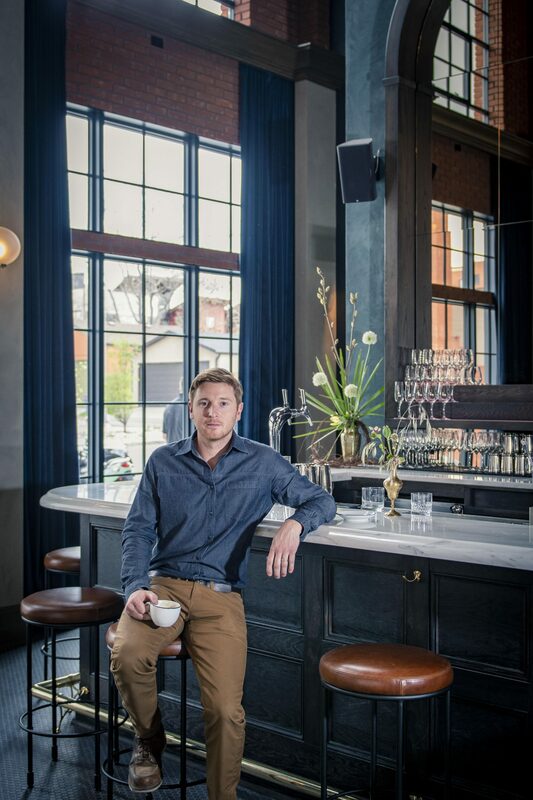 Colorado property developer Ryan Diggins entered the hospitality world with a bang last year, opening the award-winning Ramble Hotel in Denver. Denver, Colorado, is booming. Cranes pierce the skyline—with its enviable Rocky Mountain backdrop—and the city’s cultural scene is undergoing a bona fide renaissance. One of the neighborhoods at the center of this activity is River North Art District, where former warehouses have become art studios, music venues and top restaurants. The street art scene has garnered international attention with artists like JR and Shepard Fairey participating in its mural festival. This past year, The Ramble hotel opened there too, with an outpost of legendary bar Death & Co to boot. The hotel earned immediate acclaim for its design—inspired by Denver’s Gold Rush roots—and all-around awesomeness, landing on the pages of Travel + Leisure, Robb Report, and Conde Nast Traveler. Behind The Ramble’s success is Ryan Diggins, one of Denver’s most prominent property developers and newly minted hotelier. Spherical, which designed The Ramble’s website, recently caught up with Diggins to learn more about his new-found passion for hotels, and how inexperience can be a blessing. What do you love about River North, and what made it the right location for The Ramble? Some of the best nights of my 20s were spent exploring this neighborhood. For me, everything felt uninhibited and exciting: the grittiness was appealing; the artistic community was vibrant. Basically everything that I wasn’t at the time, I could find in RiNo. It helped shape a slightly different version of myself. Long story short, I’ve always romanticized this part of town, and figured that our guests would too. Was there an “aha!” moment where you decided you wanted to open a hotel? Definitely. I had been doing a lot of traveling, catching up with friends around the country, and I noticed we were spending all our time at hotels. This just isn’t something you do in Denver, which always bothered me. I remember I was back in Denver complaining about how lame our hotel options were, when the lightbulb first flickered—why don’t I try to create one? The Ramble is a new build. Yet design-wise, it very much harkens back to RiNo’s warehouse days. What made you opt for that route vs. something totally modern for the area? Our design is a reaction to a lot of the out-of-context architecture that is plaguing our city right now. I read an architectural op-ed awhile back asking something along the lines of ‘what’s wrong with standing out by blending in?’ It’s a bit disheartening that our little 3-story building has gained so much notoriety when all we did was harken back to the quality and craftsmanship that’s evident all around us. Denver has grown at a breakneck pace over the last five years and this seemingly endless demand has placed speed-to-market and value engineering as the top drivers for developers and architects. You don’t hear many people talking about ‘legacy buildings’ these days, but as with every cycle I’m sure it will swing back toward beauty and quality. We’ve had many builders and architects reach out to us with questions about every aspect on our building (inside and out), so things are looking up. You’ve been very involved with every aspect of The Ramble since day one, from website decisions to picking which lamp screws to use. When you got into the weeds of it, were you surprised at all at just how many weeds there actually were? So. Many. Decisions. From the onset I really embraced the fact that every single decision in this building ultimately needed my approval. The dream started in my head and I needed to make sure it was expressed correctly. We had some very talented people bringing The Ramble to life, but I figured that my gatekeeping would be one of the key differentiators between The Ramble and a ‘concept’ hotel. And now that the hotel’s opened, have you been able to breathe? Yes! I didn’t realize how heavy all of it was weighing on me until a few months after we opened. I feel like a different person now. You’ve mentioned that you think many hotels lack personality and character because the people behind them are industry pros who just keep churning out the same type of Ace knockoffs. Can you explain? Everything is borrowed. The Ramble Hotel isn’t some proprietary concept, it’s an amalgamation of many places I’ve been. My true north was to create what was best for this neighborhood, in this moment, and ultimately to build my dream hotel. The Ace knockoffs are so brutal because of their inauthenticity. A large corporation or investment group can’t concept punk-rock and irreverence because they are too many layers removed. Shabby chic design is only charming when its roots are born out of necessity. What details excited you the most, that maybe a traditional hotelier might have thought couldn’t be done? Probably our deal with Death & Co. We gave up control to bring in a different voice than ours. I don’t know of any other hotel that leases their entire lobby to another business. Design input is one thing…but how have you found the process of running a hotel? Without an external management company, how did you figure out the staffing requirements and the logistics of day-to-day operations? This project was in the no-pressure zone (meaning no investment) for a while, so I made it my job to learn as much about the industry as possible before the dream became a reality. I would chat with hotel general managers, front desk agents, owners, management companies, property management software developers…basically anyone that I could steal a few minutes from. I asked as many greenhorn questions as I could before we became the competition. Once I was comfortable with the business, then we moved into phase two, which was to engage a hotel consultant to help us build our business plan and our operating budget. Let’s talk Death & Co. When you approached the team there, did you have any inclination they’d even consider opening an outpost outside of NYC? I figured it was a coin flip that they would call me back. What made them the perfect partner for your lobby bar, and what makes Death & Co a great addition to Denver? Death & Co holds such a reverence for the quality of the cocktail, and they still romanticize what a truly great cocktail can mean to a guest. A very good cocktail bar is a theatrical experience you can get lost in, and I always felt their bartenders see the experience through that lens: the curtains are drawn, and they are putting on a show. Hotels needs that production element too, and I thought they could bring it home for us. How would you summarize The Ramble in one sentence? An attempt to be of the moment and timeless. What would you tell someone from outside the hotel world who’s hoping to open their own hotel? Spend as much time as possible being an opinionated guest. Reflect on your experiences and deconstruct what led to some of your ‘best nights’ or most memorable stays. You need to have deeply rooted convictions and opinions before you enter an unknown market. Your vision needs a foundation. If it’s abstract, then ‘experts’ will sweep you away with received knowledge and your dream will be commandeered.